The USB 2.0 wireless card supporting 802.11b/g (2.4GHz) radio operation. It provides high-speed wireless connection with data rate up to 54Mbps. 2dBi or higher gain antenna could be incorporated into adapter easily. The shirking dimension, light weight & lower power consumption design can easily integrate into a wide range of computer and Laptop devices. 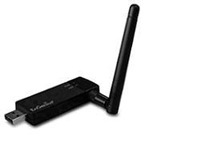 To protect your wireless connectivity, the high-speed wireless USB adapter can encrypt all wireless transmissions through 64/128-bit WEP data encryption and also supports WPA and WPA2(AES). This is a Ralink RT73 series USB Wireless LAN Card. Senao EUB-3701 EXT Wireless USB Adapter Windows 98/ME/2000/XP Drivers, 2008/01/29, 7.09 MB Download.